Low in carbs and high in antioxidants, these little treats are a favorite in my household. They are the perfect answer for a sweet tooth without sending blood glucose levels sky high. Each drop has about 8 carbs. Heat chips in the microwave for 1 minute. Stir and return to microwave for 30 seconds and stir. Repeat until chips are melted, stirring after each heating. Drop onto parchment or waxed paper with a spoon. Let set for 5 minutes. 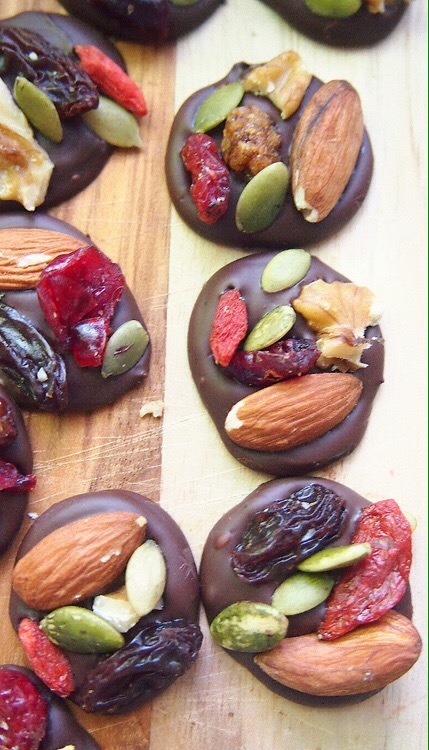 Arrange fruit, seeds, and nuts on each chocolate drop. Let set for another hour, or place in the refrigerator for 10 minutes. Enjoy! Sounds really good, I’m going to try making these over spring break! Those look so good! As spring break approaches those look like a great “treat yourself” snack that will not make you feel guilty afterwards!